March 18, 2016While at the airport waiting for our flight we reflected on what a great meal we had at The Daily Grill on Century Blvd in Los Angeles last night for Wayne’s bday dinner. We started with an artichoke and spinach dip with perfectly toasted crostini which came after the home made bread right out of the oven which was divine but overshadowed the appetizer a bit. Wayne had the short ribs with horseradish mashed potatoes topped with shoe string onion rings and those potatoes with the onions were delicious. Wayne loved the short ribs which were presented off the bone. I opted for a baked potato and everything I could imagine to top it with was on the side. What a feast I enjoyed. For Wayne’s bday they gave us a huge bowl of vanilla ice cream topped with chocolate syrup and had two moist brownies on the side. Absolutely wonderful bday dinner and we will pop back in on our trip home. We had a great night sleep thanks to a complementary night cap from the hotel for Wayne’s bday on a really comfy bed at La Quinta but unfortunately we had to be up at 4:00am to catch the 5:00am shuttle to the airport. No traffic to the airport and the Trek thru the airport was a breeze with TSA pre check. Our flight was a gem with the free tickets we won at Wayne’s 1/2 marathon in Washington and the upgrade to 1st class with air miles for the trip down. Sure hope I can score the same for our trip home. Customs was a breeze and then we were met by Eddie from GAdventures and he called Juan our driver. Our trip to our hotel was rather long due to traffic congestion caused by a major road closure. It was a fun trip as Eddie quizzed us on our Spanish and gave us lots of good info about Costa Rica and our tour. We arrived at Autentico, our hotel, and after going to our room to unload our bags we set out to find an ATM to get some Colones and then on to the supermarket to score a little hooch. Both missions accomplished we headed for the hotel bar to celebrate our arrival. I ordered a Tanqueray and Wayne had a Jack Danies on the rocks and paid $3.60 each or $2,000 colones. The exchange rate is insane with a $10,000.00 colone bill equaling $18.00. We decided to just chill at the hotel and had dinner out by the pool. Wayne had pasta bolognese and I did the grilled vege plate. 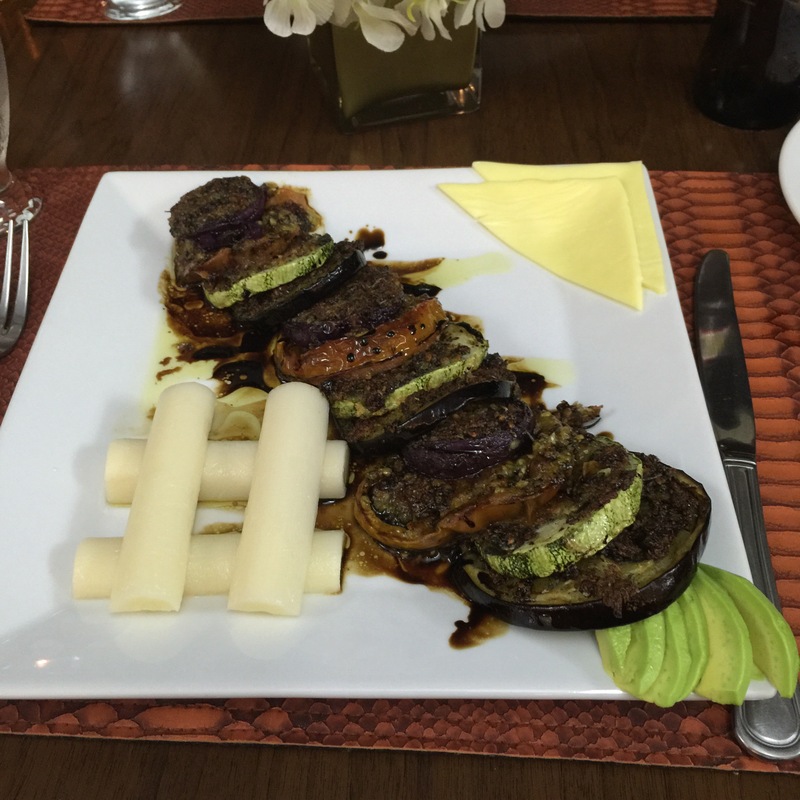 His was really good and mine was a lot of eggplant which is not my favorite vegetable. There were a lot of grilled red onions also so dinner was redeemed and moved to the palatable side of the plate. Wayne enjoyed the addition of the eggplant to his menu. Will feel good to get to bed tonight as 4:00am was a long time ago. 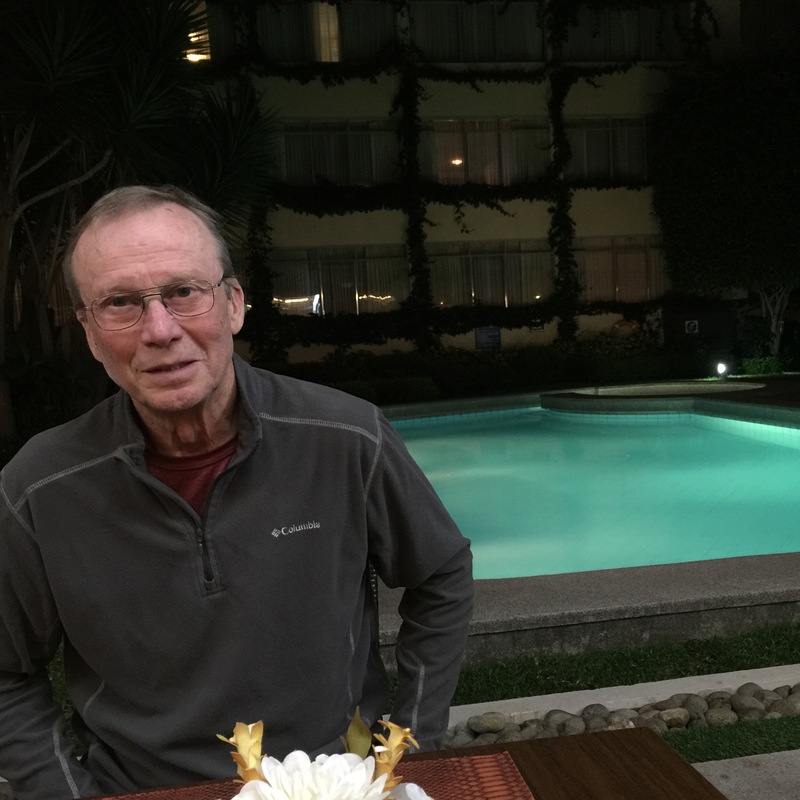 My cutie 73 year old man in Costa Rica and my grilled vegetables. Glad you had a safe trip! Looking to hear more.